The family of an American hostage killed by ISIS is reacting to news that one of the terrorist group’s most notorious militants was targeted by a U.S airstrike. A U.S. drone strike targeted a vehicle in the ISIS stronghold of Raqqa, Syria, believed to be transporting the masked Islamic State militant known as "Jihadi John," defense officials said. It is still yet to be determined if the Kuwait-born British citizen, who appears in several videos depicting the beheading of hostages, was killed. "It will take time to definitely declare whether we had success," Col. Steve Warren, spokesman for the U.S. military operation against ISIS, told reporters during a briefing, adding that officials are "reasonably certain" Mohammed Emwazi was killed. One of the Americans executed by the extremist was 40-year-old New Hampshire journalist James Foley. He was beheaded in August 2014, two years after he was abducted in Syria. The families of hostages murdered by ISIS are reacting to news that "Jihadi John" was targeted by a U.S. airstrike. 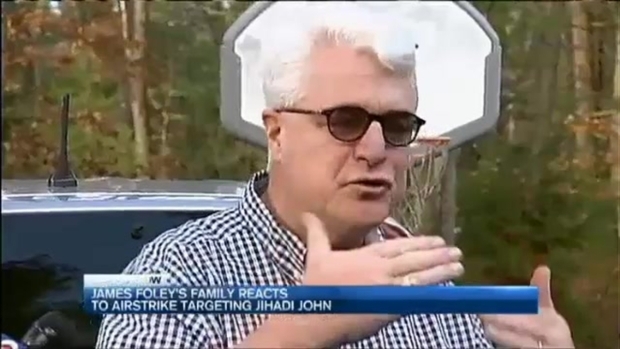 "I'm not impressed at all that we may have eliminated Jihadi John," said James Foley's father John. They were strong words from the father of murdered New Hampshire journalist James Foley, as news that a U.S. airstrike in Syria targeting his son's killer "Jihadi John" may have been successful. "Jihadi John makes no difference to us, Jim is dead, bombing him won't bring Jim back, it won't change the war, we need eliminate ISIS," said John Foley. Foley spoke outside his Rochester, New Hampshire home Friday, saying he fears this may only inspire others within ISIS to step up to replace Mohammed Emwazi, the British man videotaped beheading several hostages nicknamed Jihadi John. "It glorifies his existence which facilitates potentially further recruitment," Foley said. Foley says were his son still alive, he would not be satisfied with this attack either. "Jimmy would say the same thing," said Foley, "he would want justice for all the people who are dying." Foley says he doesn't think it's something the U.S. should be boasting about. "If that's our accomplishment, God bless us," said Foley, "if that's all we've done, give me a break." "It is a very small solace to learn that Jihadi John may have been killed by the U.S. government. His death does not bring Jim back. If only so much effort had been given to finding and rescuing Jim and the other hostages who were subsequently murdered by ISIS, they might be alive today. Our focus is on Jim's life and all the good that he did in the world. We remain humble and proud of his unwavering commitment to give voice to the voiceless as a journalist, a teacher and a friend. As we continue to honor Jim's life, we are grateful to the thousands of people who supported Jim throughout his captivity and who continue to support his legacy today through The James W. Foley Legacy Foundation. The Foundation is committed to defending the rights of every American citizen by advocating for the safe release of Americans kidnapped abroad, advancing safety measures for freelance journalists in conflict zones, and providing underprivileged youth with access to education." Foley's death was recorded and released in one of numerous propoganda videos made by the Islamic militants. The beheadings of American-Israeli journalist Steven Sotloff, U.S. aid worker Abdul-Rahman Kassig, British aid workers David Haines and Alan Henning and Japanese journalist Kenji Goto were also recorded.